QUESTION 1: How can I get back what I lost (in technique etc) after 6 months of not playing? QUESTION 2: Some times I feel frustrated because I can't play everything I would like to play right away, please give me an advice. QUESTION 3: Can you sell me some tabs? The 2 brothers Farruquito and Farruco are grandchildren of the great legendary flamenco gypsy dancer Farruco, they not only are amazing flamenco dancers who follow the footsteps of their granfather, but they are passionate about flamenco guitar and they also play great! Enjoy the pictures and video! Almost all the members of the gypsy community know a little of dance, a little of cante (singing) and a little of palmas (handclaps), cajón (rhythm) or guitar. 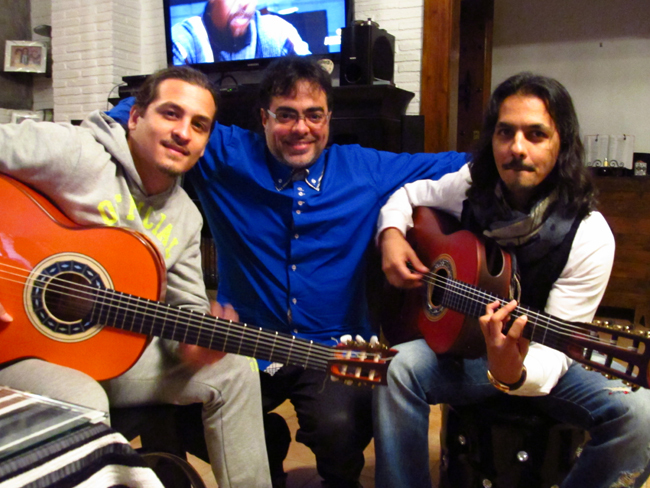 Farruquito and his brother Farruco aren't the exception, but what is amazing of these two extremely talented artists is that they perform all the above mentioned disciplines: cante, guitar and dance really great! For example, Farruquito actually composes the music he uses for his own performances and teach it to his musicians! Farruco is the yonger brother of Farruquito, he is a virtuoso in rhythm and has mastered flamenco footwork and remates in an amazing way!